MESA, Arizona – Dec. 7, 2017 – Mesa Community College partners with Subaru of America to train the next generation of Subaru technicians. Unlike most original-equipment manufacturer (OEM) education programs, Subaru-U is designed to create partnerships between Subaru of America, the retailer and high performing NATEF/AYES-accredited secondary and postsecondary schools. Subaru-U was developed in 2016 in response to the ever-increasing need for new technicians for Subaru’s service centers. 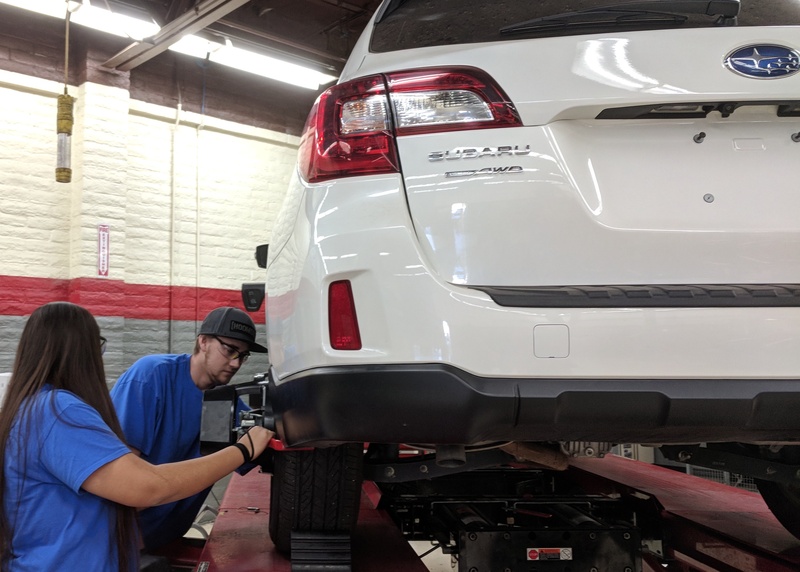 By integrating Subaru's Web-Based Training (WBT) into MCC’s existing curriculum, students can take most of the entry-level training that is required of Subaru technicians. Students may opt to take a Subaru Level 2 Instructor-Led Training Test-Out to advance their training even further. Subaru’s WBTs are offered at no additional charge to the student or the college. Subaru-U’s course materials cover information such as Repair Order write up, Introduction to Subaru Tech Information Systems (STIS), Generic Hybrid, Noise Vibration and Harshness (NVH), along with theory and diagnosis of major vehicle systems. At this time, there are 18 WBT’s offered. The automotive training program at Mesa Community College is accredited by the National Automotive Technicians Education Foundation (NATEF) and the National Institute for Automotive Service Excellence (ASE). MCC is the third Arizona community college to partner with Subaru and the only one in Maricopa County. Learn more about the MCC Automotive Performance Program at mesacc.edu/programs/automotive-performance. Registration for the Spring 2018 semester is open. Subaru of America, Inc. (SOA) is a wholly owned subsidiary of Subaru Corporation of Japan. Headquartered at a zero-landfill office in Cherry Hill, N.J., the company markets and distributes Subaru vehicles, parts and accessories through a network of more than 620 retailers across the United States. All Subaru products are manufactured in zero-landfill production plants and Subaru of Indiana Automotive, Inc. is the only U.S. automobile production plant to be designated a backyard wildlife habitat by the National Wildlife Federation. SOA is guided by the Subaru Love Promise, which is the company’s vision to show love and respect to everyone, and to support its communities and customers nationwide. Over the past 20 years, SOA has donated more than $120 million to causes the Subaru family cares about, and its employees have logged more than 40,000 volunteer hours. As a company, Subaru believes it is important to do its part in making a positive impact in the world because it is the right thing to do. For additional information visit media.subaru.com. Maricopa Community Colleges is an EEO/AA institution.